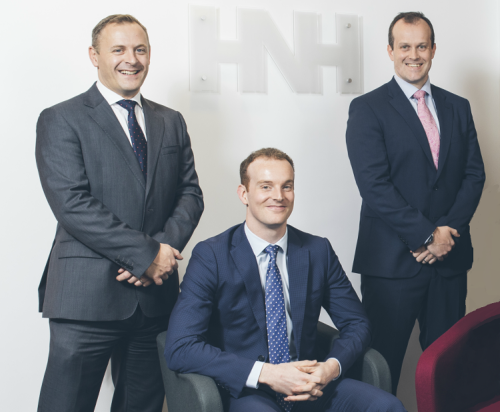 Left to right: Craig Holmes, Peter Graham and Richard Moorehead are each involved in deals shortlisted for the 2019 NI Dealmakers Awards. We have been shortlisted in the Corporate Finance Team of the Year category. Craig Holmes features in the Dealmaker of the Year list. While, we were involved in a number of deals which have also gained prominence – the sale of fscom’s KYC Pro product to PWC, funding for ISL Waste Management Ltd (both feature in Deal of the Year – below £2.5m) and the acquisition of Alumasc Facades by Kilwaughter (Deal of the Year £2.5 – £10m). “2018 was a fantastic year for HNH’s CF team, which nearly doubled in size from five to nine team members over the course of the year. As well as giving us crucial extra bandwidth, our targeted recruitment has added expertise in financial modelling, transaction services and debt advisory,” he said. “We completed 15 transactions during 2018, covering a wide range of sectors and transaction types. Having three of our deals (Kilwaughter, FSCom and ISL) shortlisted for deal of the year is testament to the strength of our team and their hard work and dedication. The annual NI Dealmakers Awards aim to recognise the high quality professional advisory firms and funders in Northern Ireland and some of the best deals in which they have been involved in over the previous calendar year. All winners will be revealed at the gala dinner event set to take place at the Stormont Hotel in Belfast on 14 March 2019.